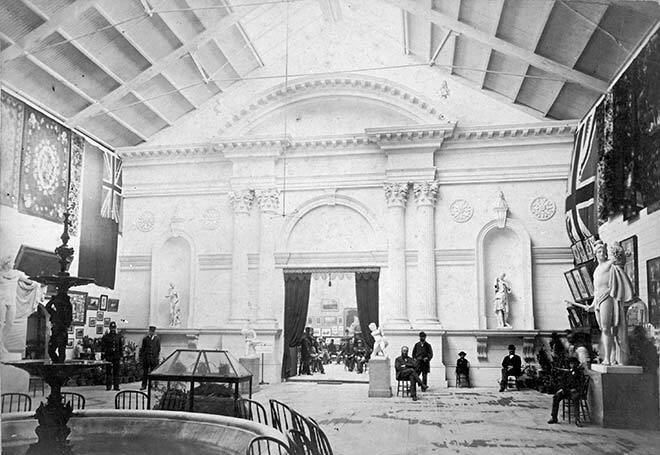 This scene of the interior of the main building at the 1882 New Zealand International Exhibition in Christchurch shows the classical style of the structure. It was a temporary building designed by Thomas Stoddart Lambert, a local architect and city councillor. The exhibition was located on a 1.8-hectare site in Hagley Park. Although more than 200,000 people visited in its 14-week season, the exhibition lost money.